Elvis Enthusiasts Unite: Hummus will cure everything that ails you. Hummus will cure everything that ails you. I have a confession to make: I eat hummus every single day. This is not an exaggeration. Next to my cottage cheese staple, I have anywhere from 1-5 containers of hummus in my fridge at any given time. Sometimes I dive into it before breakfast, but I always go straight to it once I get home from work. Not everyone shares this kind of fascination, I realize that. But it does my heart good to know that, when my nephew had it for his first time a couple days ago, this was his immediate reaction. 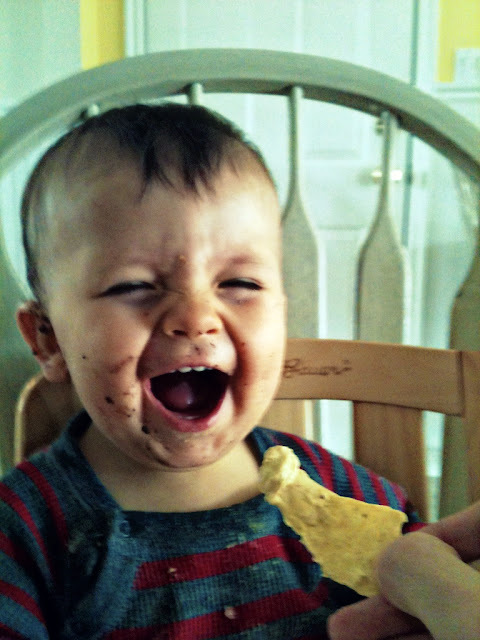 I'm pretty sure he's mirroring what my taste buds do every time they get their hummus fix. He'll go far, this boy. Does his uncle proud, he does. One of my absolute favorite snacks (or meals) is to use hummus as a little dip for a wheat thin, slice of cucumber, and slice of cheddar cheese. It's like a heavenly little sandwich! One day, I want to learn how to make hummus.